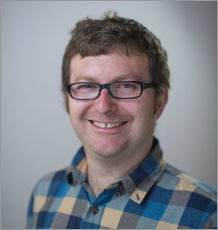 Dr Mick Craig is a neurophysiologist interested in how interneurons can control synchronous neuronal network activity, and how different brain regions coordinate their activity across long distances. While comprising only a small percentage of cortical neurons, inhibitory interneurons play a fundamental role in coordinating and pacing the rhythm of neuronal oscillations. Mick's previous work has included studying slow oscillations in sensory and entorhinal cortices, and faster rhythms (gamma oscillations and sharp-wave ripples) in the hippocampus. The research in Mick's group uses a combination of behavioural, in vivo and in vitro electrophysiological and optogenetic methods to understand the cellular circuitry through which different brain regions communicate across long distances. They are also interested in studying how these long-range projections are disrupted in psychiatric and neurodegenerative disorders. Dr Mick Craig completed his undergraduate degree in Neuroscience at the University of Glasgow in 2006. This degree included a year in the pharmaceutical industry, where he carried out schizophrenia research at Merck, Sharp and Dohme in Harlow, Essex. He then moved to the University of Oxford to study on a four year Wellcome Trust DPhil in the OXION programme, working with Prof Ole Paulsen and Dr Louise Upton, graduating in 2011. In the final year of Mick's doctoral studies, Prof Paulsen moved to the University of Cambridge to take up the Chair of Physiology, so once Mick completed his DPhil, he spent a few months in Cambridge before moving to the National Institutes of Health (Bethesda, USA) in 2011, to work as a Postdoctoral Visiting Fellow in the group of Dr Chris McBain. Mick moved back to the UK in early 2016 to establish his research group at the University of Exeter on a Research Fellowship funded by the Vandervell Foundation. My research group aims to determine how long-range connections allow different regions of the brain to synchronise their activity, with a particular focus on interactions between various nuclei making up the Papez circuit (such as the prefrontal cortex, entorhinal cortex, hippocampus and subiculum). We are also interested in understanding how inhibitory interneurons can control rhythmic network activity: although interneurons make up only a minority of cortical neurons, they play a fundamental role in coordinating and pacing the activity of principal cells. We approach these questions by using a combination of behavioural, electrophysiological (in vitro and in vivo), optogenetic and viral tracing techniques. Our principle aim is to discover the laminar and cellular specificity of long-range connections between different circuits, as this knowledge is essential if we are to learn why different conditions, such as dementia or schizophrenia, can affect the same circuits in the brain but have remarkably different symptoms. As well as studying the connectivity within the Papez circuit in healthy conditions, we are also carrying out a number of projects using animal models of Alzheimer's disease, as well as rare genetic variants (CNVs) that increase an individual's susceptibly to psychiatric illness. If you are interested in neural circuits and want to join our rapidly growing team of neurophysiologists in Exeter, please get in touch. Craig MT, McBain CJ (2015). Fast gamma oscillations are generated intrinsically in CA1 without the involvement of fast-spiking basket cells. Journal of Neuroscience, 35(8), 3616-3624. © 2015 the authors. Information processing in neuronal networks relies on the precise synchronization of ensembles of neurons, coordinated by the diverse family of inhibitory interneurons. Cortical interneurons can be usefully parsed by embryonic origin, with the vast majority arising from either the caudal or medial ganglionic eminences (CGE and MGE). Here, we examine the activity of hippocampal interneurons during gamma oscillations in mouse CA1, using an in vitro model where brief epochs of rhythmic activity were evoked by local application of kainate. We found that this CA1 KA-evoked gamma oscillation was faster than that in CA3 and, crucially, did not appear to require the involvement of fast-spiking basket cells. In contrast to CA3, we also found that optogenetic inhibition of pyramidal cells in CA1 did not significantly affect the power of the oscillation, suggesting that excitationmaynot be essential forgammagenesis in this region.Wefound that MGE-derived interneurons were generally more active than CGE interneurons during CA1 gamma, although a group of CGE-derived interneurons, putative trilaminar cells, were strongly phase-locked with gamma oscillations and, together with MGE-derived axo-axonic and bistratified cells, provide attractive candidates for being the driver of this locally generated, predominantly interneuron-driven model of gamma oscillations. Pelkey KA, Barksdale E, Craig MT, Yuan X, Sukumaran M, Vargish GA, Mitchell RM, Wyeth MS, Petralia RS, Chittajallu R, et al (2015). Pentraxins coordinate excitatory synapse maturation and circuit integration of parvalbumin interneurons. Neuron, 85(6), 1257-1272. © 2015 Elsevier Inc. Circuit computation requires precision in the timing, extent, and synchrony of principal cell (PC) firing thatis largely enforced by parvalbumin-expressing, fast-spiking interneurons (PVFSIs). To reliably coordinate network activity, PVFSIs exhibit specialized synaptic and membrane properties that promote efficient afferent recruitment such as expression of high-conductance, rapidly gating, GluA4-containing AMPA receptors (AMPARs). We found that PVFSIs upregulate GluA4 during the second postnatal week coincident with increases in the AMPAR clustering proteins NPTX2 and NPTXR. Moreover, GluA4 is dramatically reduced in NPTX2-/-/NPTXR-/- mice with consequent reductions in PVFSI AMPAR function. Early postnatal NPTX2-/-/NPTXR-/- mice exhibit delayed circuit maturation with a prolonged critical period permissive for giant depolarizing potentials. Juvenile NPTX2-/-/NPTXR-/- mice display reduced feedforward inhibition yielding a circuit deficient in rhythmogenesis and prone to epileptiform discharges. Our findings demonstrate an essential role for NPTXs in controlling network dynamics highlighting potential therapeutic targets for disorders with inhibition/excitation imbalances such as schizophrenia. Craig MT, Mayne EW, Bettler B, Paulsen O, Mcbain CJ (2013). Distinct roles of GABA<inf>B1a</inf>- and GABA<inf>B1b</inf>-containing GABA<inf>B</inf> receptors in spontaneous and evoked termination of persistent cortical activity. Journal of Physiology, 591(4), 835-843. During slow-wave sleep, cortical neurons display synchronous fluctuations between periods of persistent activity ('UP states') and periods of relative quiescence ('DOWN states'). Such UP and DOWN states are also seen in isolated cortical slices. Recently, we reported that both spontaneous and evoked termination of UP states in slices from the rat medial entorhinal cortex (mEC) involves GABAB receptors. Here, in order to dissociate the roles of GABAB1a- and GABAB1b-containing receptors in terminating UP states, we used mEC slices from mice in which either the GABAB1a or the GABAB1b subunit had been genetically ablated. Pharmacological blockade of GABAB receptors using the antagonist CGP55845 prolonged the UP state duration in both wild-type mice and those lacking the GABAB1b subunit, but not in those lacking the GABAB1a subunit. Conversely, electrical stimulation of layer 1 could terminate an ongoing UP state in both wild-type mice and those lacking the GABAB1a subunit, but not in those lacking the GABAB1b subunit. Together with previous reports, indicating a preferential presynaptic location of GABAB1a- and postsynaptic location of GABAB1b-containing receptors, these results suggest that presynaptic GABAB receptors contribute to spontaneous DOWN state transitions, whilst postsynaptic GABAB receptors are essential for the afferent termination of the UP state. Inputs to layer 1 from other brain regions could thus provide a powerful mechanism for synchronizing DOWN state transitions across cortical areas via activation of GABAergic interneurons targeting postsynaptic GABAB receptors. © 2013 the Physiological Society. Chittajallu R, Craig MT, Mcfarland A, Yuan X, Gerfen S, Tricoire L, Erkkila B, Barron SC, Lopez CM, Liang BJ, et al (2013). Dual origins of functionally distinct O-LM interneurons revealed by differential 5-HT<inf>3A</inf>R expression. Nature Neuroscience, 16(11), 1598-1607. Forebrain circuits rely upon a relatively small but remarkably diverse population of GABAergic interneurons to bind and entrain large principal cell assemblies for network synchronization and rhythmogenesis. Despite the high degree of heterogeneity across cortical interneurons, members of a given subtype typically exhibit homogeneous developmental origins, neuromodulatory response profiles, morphological characteristics, neurochemical signatures and electrical features. Here we report a surprising divergence among hippocampal oriens-lacunosum moleculare (O-LM) projecting interneurons that have hitherto been considered a homogeneous cell population. Combined immunocytochemical, anatomical and electrophysiological interrogation of Htr3a-GFP and Nkx2-1-cre:RCE mice revealed that O-LM cells parse into a caudal ganglionic eminence-derived subpopulation expressing 5-HT 3A receptors (5-HT 3A Rs) and a medial ganglionic eminence-derived subpopulation lacking 5-HT 3A Rs. These two cohorts differentially participate in network oscillations, with 5-HT 3A R-containing O-LM cell recruitment dictated by serotonergic tone. Thus, members of a seemingly uniform interneuron population can exhibit unique circuit functions and neuromodulatory properties dictated by disparate developmental origins. © 2013 Nature America, Inc. All rights reserved. Chittajallu R, Wester JC, Craig MT, Barksdale E, Yuan XQ, Akgül G, Fang C, Collins D, Hunt S, Pelkey KA, et al (In Press). Afferent specific role of NMDA receptors for the circuit integration of hippocampal neurogliaform cells. Nat Commun, 8(1). Afferent specific role of NMDA receptors for the circuit integration of hippocampal neurogliaform cells. Appropriate integration of GABAergic interneurons into nascent cortical circuits is critical for ensuring normal information processing within the brain. Network and cognitive deficits associated with neurological disorders, such as schizophrenia, that result from NMDA receptor-hypofunction have been mainly attributed to dysfunction of parvalbumin-expressing interneurons that paradoxically express low levels of synaptic NMDA receptors. Here, we reveal that throughout postnatal development, thalamic, and entorhinal cortical inputs onto hippocampal neurogliaform cells are characterized by a large NMDA receptor-mediated component. This NMDA receptor-signaling is prerequisite for developmental programs ultimately responsible for the appropriate long-range AMPAR-mediated recruitment of neurogliaform cells. In contrast, AMPAR-mediated input at local Schaffer-collateral synapses on neurogliaform cells remains normal following NMDA receptor-ablation. These afferent specific deficits potentially impact neurogliaform cell mediated inhibition within the hippocampus and our findings reveal circuit loci implicating this relatively understudied interneuron subtype in the etiology of neurodevelopmental disorders characterized by NMDA receptor-hypofunction.Proper brain function depends on the correct assembly of excitatory and inhibitory neurons into neural circuits. Here the authors show that during early postnatal development in mice, NMDAR signaling via activity of long-range synaptic inputs onto neurogliaform cells is required for their appropriate integration into the hippocampal circuitry. Pelkey KA, Chittajallu R, Craig MT, Tricoire L, Wester JC, McBain CJ (In Press). Hippocampal GABAergic Inhibitory Interneurons. Physiol Rev, 97(4), 1619-1747. In the hippocampus GABAergic local circuit inhibitory interneurons represent only ~10-15% of the total neuronal population; however, their remarkable anatomical and physiological diversity allows them to regulate virtually all aspects of cellular and circuit function. Here we provide an overview of the current state of the field of interneuron research, focusing largely on the hippocampus. We discuss recent advances related to the various cell types, including their development and maturation, expression of subtype-specific voltage- and ligand-gated channels, and their roles in network oscillations. We also discuss recent technological advances and approaches that have permitted high-resolution, subtype-specific examination of their roles in numerous neural circuit disorders and the emerging therapeutic strategies to ameliorate such pathophysiological conditions. The ultimate goal of this review is not only to provide a touchstone for the current state of the field, but to help pave the way for future research by highlighting where gaps in our knowledge exist and how a complete appreciation of their roles will aid in future therapeutic strategies. Li J, Han W, Pelkey KA, Duan J, Mao X, Wang Y-X, Craig MT, Dong L, Petralia RS, McBain CJ, et al (2017). Molecular Dissection of Neuroligin 2 and Slitrk3 Reveals an Essential Framework for GABAergic Synapse Development. Neuron, 96(4), 808-826.e8. Full text. Pelkey KA, Barksdale E, Craig MT, Yuan X, Sukumaran M, Vargish GA, Mitchell RM, Wyeth MS, Petralia RS, Chittajallu R, et al (2016). Corrections to "Pentraxins Coordinate Excitatory Synapse Maturation and Circuit Integration of Parvalbumin Interneurons" [Neuron 85, 1257-1272; March 18, 2015]. Neuron, 90(3). Craig MT, McBain CJ (2015). Navigating the circuitry of the brain's GPS system: Future challenges for neurophysiologists. Hippocampus, 25(6), 736-743. Author URL. Craig MT, McBain CJ (2014). The emerging role of GABA<inf>B</inf> receptors as regulators of network dynamics: Fast actions from a 'slow' receptor?. Current Opinion in Neurobiology, 26, 15-21. Convention holds that ionotropic receptors mediate fast neurotransmission and that 'slow' G-protein coupled metabotropic receptors have a secondary, modulatory role in the control of neuronal networks. Here, we discuss recent evidence showing that activation of metabotropic GABAB receptors in cortical layer 1 can powerfully inhibit principal cell activity and that their activation can rapidly halt ongoing network activity. Inputs from both within and outwith the cortex converge upon layer 1 where they target various populations of interneurons, including neurogliaform cells. We argue that neurogliaform cells are the main effector of a powerful inhibitory circuit that, acting through GABAB receptors, can be differentially recruited by long-range connections to serve in roles as diverse as conscious perception and memory consolidation. © 2013. Matta JA, Pelkey KA, Craig MT, Chittajallu R, Jeffries BW, McBain CJ (2013). Developmental origin dictates interneuron AMPA and NMDA receptor subunit composition and plasticity. Nat Neurosci, 16(8), 1032-1041. Developmental origin dictates interneuron AMPA and NMDA receptor subunit composition and plasticity. Disrupted excitatory synapse maturation in GABAergic interneurons may promote neuropsychiatric disorders such as schizophrenia. However, establishing developmental programs for nascent synapses in GABAergic cells is confounded by their sparsity, heterogeneity and late acquisition of subtype-defining characteristics. We investigated synaptic development in mouse interneurons targeting cells by lineage from medial ganglionic eminence (MGE) or caudal ganglionic eminence (CGE) progenitors. MGE-derived interneuron synapses were dominated by GluA2-lacking AMPA-type glutamate receptors (AMPARs), with little contribution from NMDA-type receptors (NMDARs) throughout development. In contrast, CGE-derived cell synapses had large NMDAR components and used GluA2-containing AMPARs. In neonates, both MGE- and CGE-derived interneurons expressed primarily GluN2B subunit-containing NMDARs, which most CGE-derived interneurons retained into adulthood. However, MGE-derived interneuron NMDARs underwent a GluN2B-to-GluN2A switch that could be triggered acutely with repetitive synaptic activity. Our findings establish ganglionic eminence-dependent rules for early synaptic integration programs of distinct interneuron cohorts, including parvalbumin- and cholecystokinin-expressing basket cells. Mayne EW, Craig MT, Mcbain CJ, Paulsen O (2013). Dopamine suppresses persistent network activity via D1-like dopamine receptors in rat medial entorhinal cortex. European Journal of Neuroscience, 37(8), 1242-1247. Cortical networks display persistent activity in the form of periods of sustained synchronous depolarizations ('UP states') punctuated by periods of relative hyperpolarization ('DOWN states'), which together form the slow oscillation. UP states are known to be synaptically generated and are sustained by a dynamic balance of excitation and inhibition, with fast ionotropic glutamatergic excitatory and GABAergic inhibitory conductances increasing during the UP state. Previously, work from our group demonstrated that slow metabotropic GABA receptors also play an important role in terminating the UP state, but the effects of other neuromodulators on this network phenomenon have received little attention. Given that persistent activity is a neural correlate of working memory and that signalling through dopamine receptors has been shown to be critical for working memory tasks, we examined whether dopaminergic neurotransmission affected the slow oscillation. Here, using an in vitro model of the slow oscillation in rat medial entorhinal cortex, we showed that dopamine strongly and reversibly suppressed cortical UP states. We showed that this effect was mediated through D1-like and not D2-like dopamine receptors, and we found no evidence that tonic dopaminergic transmission affected UP states in our model. This article is a U.S. Government work and is in the public domain in the USA. Rodríguez-Moreno A, González-Rueda A, Banerjee A, Upton AL, Craig MT, Paulsen O (2013). Presynaptic Self-Depression at Developing Neocortical Synapses. Neuron, 77(1), 35-42. A central tenet of most theories of synaptic modification during cortical development is that correlated activity drives plasticity in synaptically connected neurons. Unexpectedly, however, using sensory-evoked activity patterns recorded from the developing mouse cortex in vivo, the synaptic learning rule that we uncover here relies solely on the presynaptic neuron. A burst of three presynaptic spikes followed, within a restricted time window, by a single presynaptic spike induces robust long-term depression (LTD) at developing layer 4 to layer 2/3 synapses. This presynaptic spike pattern-dependent LTD (p-LTD) can be induced by individual presynaptic layer 4 cells, requires presynaptic NMDA receptors and calcineurin, and is expressed presynaptically. However, in contrast to spike timing-dependent LTD, p-LTD is independent of postsynaptic and astroglial signaling. This spike pattern-dependent learning rule complements timing-based rules and is likely to play a role in the pruning of synaptic input during cortical development.